It’s been a while since my last post. I was so exhausted by the wiring project that I decided to give myself a break and focus on other things. I normally obsess over the details of the hobby and it was nice to really just take some time away from it to do other things such as become a better drummer, go for a drive, hikes, bike rides etc. Only one time did I spend a weekend do ‘train’ stuff and that was a weekend of train-chasing in the Sierras. 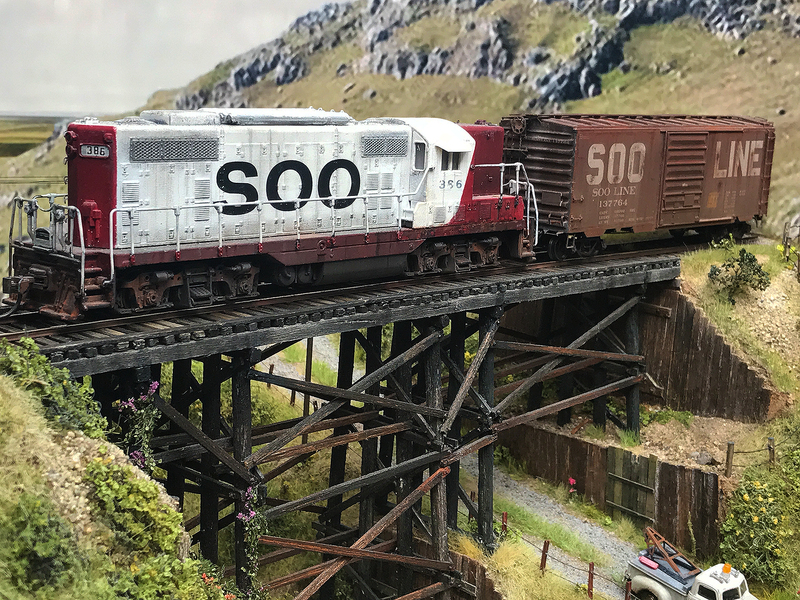 When I finally felt my model railway mojo return I decided to put The Town back on its shelf and take some time to do some other modelling projects. One of those was to learn to make realistic trees. 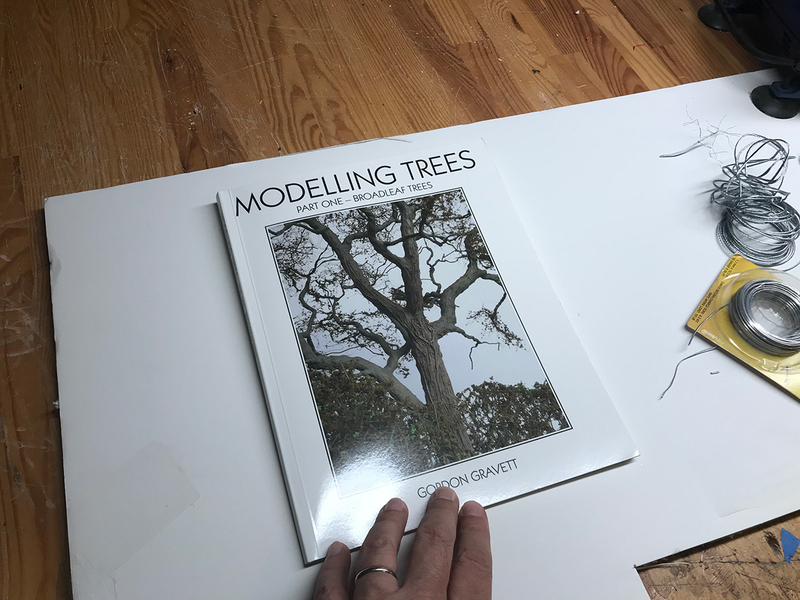 I have both Gordon Gravett’s books on trees which I picked up on a visit to the UK a couple of years ago (along with his books on static grass) and I was eager to give some of his methods a go. As with his other books they are filled with tips and methods and illustrations to help the modeler along. He also has a brief intro about trees in the landscape – how to observe and record them. 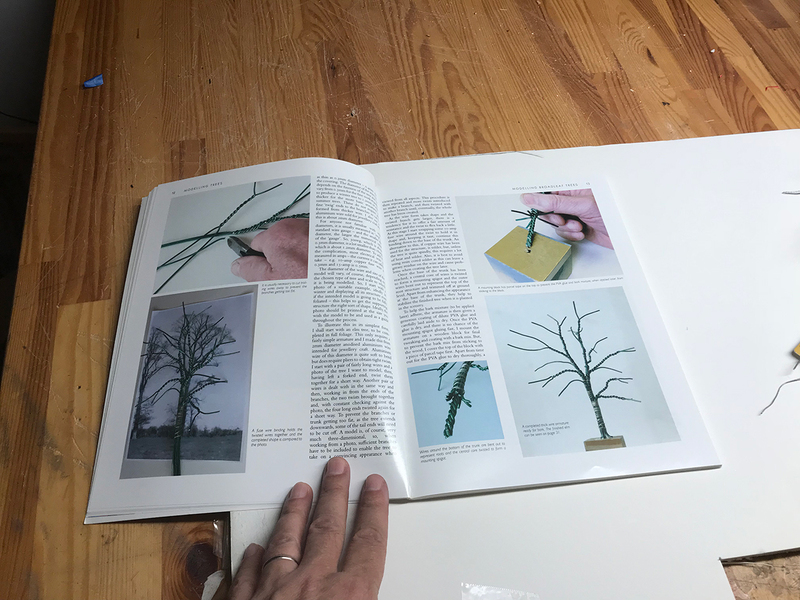 I decided just to follow along and try out his methods – not so much to actually make a good tree but just to get used to the methods and materials and gain some practice. 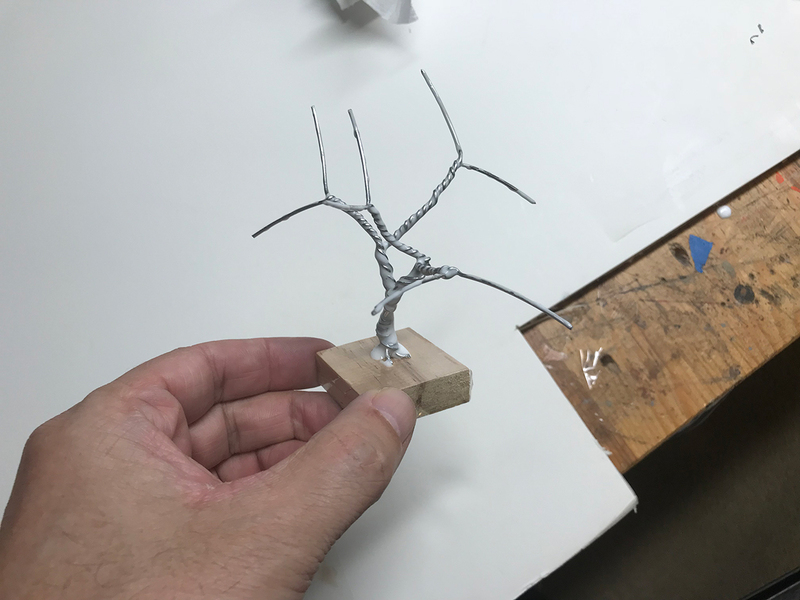 He uses aluminum wire which he twists around to form branches. It’s fairly straightforward and I got the hang of it after a couple of attempts. 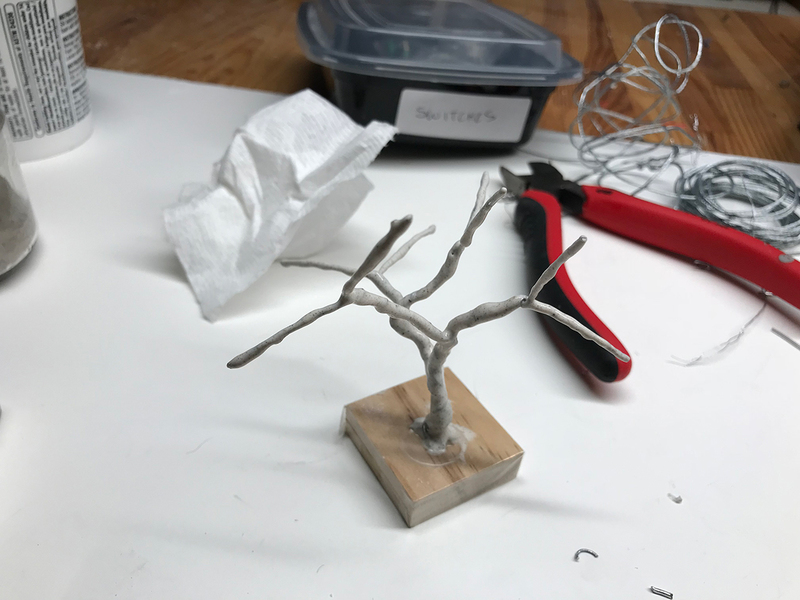 I managed to produce this basic armature which I covered in PVC before adding the bark layer and let it dry overnight. For the bark he uses a mix of PVC and something called Artex – which in the USA I believe is called popcorn paint – it’s basically textured paint. 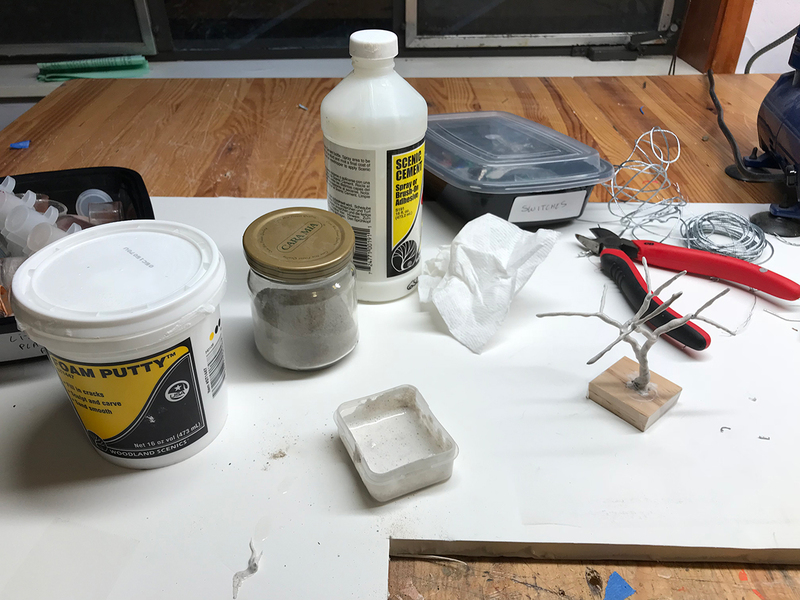 I didn’t have any of that kind of paint lying around so I decided to use PVC mixed with Woodland Scenic’s foam putty. It mixed very well and give the substance enough body so that it held fast to the stem. At this stage I’m not concerned with too much detailing. Gordon Gravett’s trees are miniature works of art that have had plenty of detailed attention. I’ll get to that later. Right now I just want to get an overview of the whole method. Once the bark mix was dry I gave the tree an undercoat and then an overcoat of brown. Tomorrow I’ll add leaves. 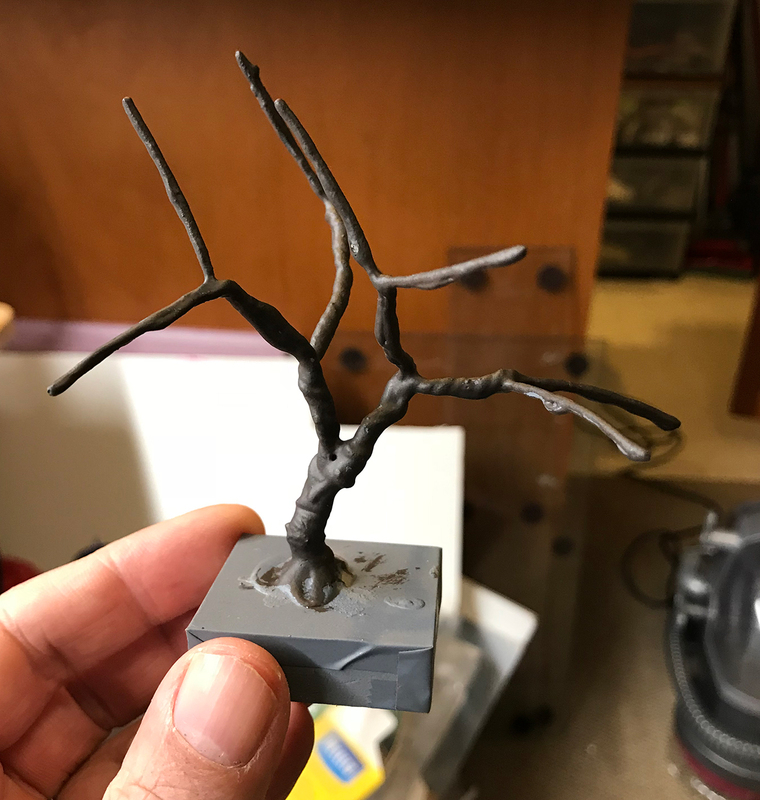 My thoughts so far are that the tree needs more branches and so for the next attempt i’ll try a slight different method which will have alot more detailed branches.